FSU Art BFA ’18 Kristen Valle has recently been awarded the McKinney Law Group Visual Arts Scholarship. This $1,000.00 scholarship is awarded each year to current college students who specialize in the visual arts (painting, drawing, printmaking, sculpture, ceramics or photography). The scholarship is awarded upon artistic merit and is judged by a panel. Valle specializes in painted portraiture and figurative art, with oil being her primary medium. Her most recent work is a display of dynamic paintings and drawings that explore the concept of the physical body in relationship to the intangible soul. With this scholarship, Kristen will use the funds to propel her in her education and further develop her craft. 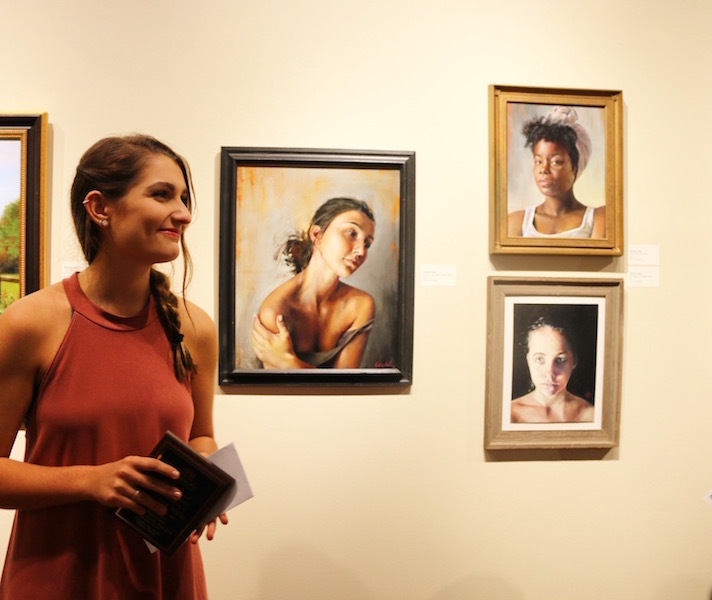 Valle has also been awarded the Mary Brown Ostlund Scholarship through the fine art awards, as well as the Excellence in Visual Arts Exhibition award. Her work is being featured in SIX and Swatch Magazine. Last fall she won 2nd place in the Gadsden Regional Exhibition of Fine Art. Also, the Portrait Society of America Conference has awarded her a tuition scholarship to attend their annual conference two years in a row.